Oh my stars that is such a lovely table runner I would love to be able to win it! I am just beginning to play with wool. I have a few scapes people have given me. I havent been any where they sale wool, I have going to have to go to one of your sites listed and buy me a piece to work on! Maybe I might win this contest and I will have this item to work on! Yeah me! Thanks Kay for all the wonderful information you bring us, your a sweetheart! Great giveaway….Love the pattern!!! I have not done alot with wool, but I plan on it! I have fused the wool, I am going to try the glue stick and staples, great idea!! I stitched using the blanket stitch, I am thinking about trying the machine….I look forward to working more with wool…Hope I win the pattern! Put my name in please! I love wool applique. I have never worked with wool before but love the look and I love to make appliques. Thanks for the chance!! I have only done one wool applique so far. I have kits to do more and am anxious to get started. Would love to win this pattern. I have often used a glue stick to keep things in place while quilting – so glad to know that it works on wool. Stapling? Wow – never thought of that for wool! I have a wool candle mat calling my name – I’ll have to try that. I have just begun working in wool and would love to make this table runner. I love the “woolies!” I have started collecting wools for a future project because it looks like so much fun. Great pattern! I don’t have any wool tips because I haven’t worked with it yet! But it is definitely on the applique To Do list — maybe this will be the pattern to get me started! I have a pattern and bought my first wool to applique, but I don’t know that much about it. I guess I need to read up on it before I just jump in. I know different people prefer different methods of applique on wool but I don’t know which one is best for me. I’m reading all tips to get ready to dive in to this project. I love this pattern. I enjoy working with wool. It is just plain fun – almost instant gratification. I usually use a glue stick — never thought about staples. I’ll have to give it a try. Thanks for the drawing. I’m new to wool, but it’s easily becoming an addiction. Thanks for all your wonderful leads to great tutorials for quilting. What a beautiful pattern…I would love to win it. 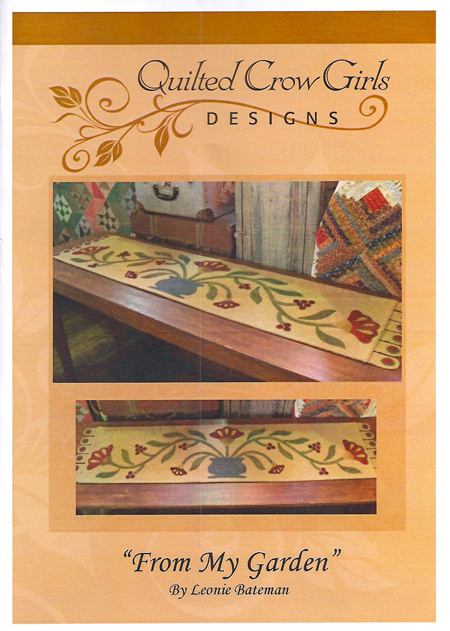 I would love to make this beautiful table runner. I have been looking for just such a pattern. I have recently started my first wool penny rug and love it! This is a beautiful table runner! This is adorable and would be so great on my dining room table! That’s a very cute pattern. I have never done wool applique but I have a dear friend who is a woolie. This would be a nice gift for her. Maybe I’ll even try it; she has a wool stash like I have a fat qt. stash and she’s very generous. Love the table runner….Hope to win!! What a delightful table runner! I LOVE wool applique and I thank you so much for sharing this information with us. Please enter me in the drawing! I’ve never worked with wool before but this pattern looks fantastic,would love to win it.